What are these tests that can force 3rd graders to repeat a year? A sample 3rd grade reading passage (with questions and answers) is provided by the Department. The passage was clearly developmentally appropriate for 3rd graders – and ridiculous for dyslexic 3rd graders who are likely to make up 15% of every classroom. But don’t take just our word for it. What was the passage appropriate for? Using different scoring metrics, the average grade determined was 4.9. So why is a high 4th grade passage being chosen to determine whether a 3rd grade should be held back in the 3rd grade? A huge problem for gate-keeping state assessment tests like the FSA is that they do not take into account the normal developmental progression of dyslexic students. 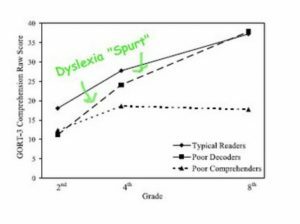 From previous educational research (see below for Premium subscribers), we know that young dyslexic school children (poor decoders) undergo a later developmental spurt (late-blooming) that allows most to comprehend grade-level reading passages at the level of their peers by the time they reach the 8th grade. Poor comprehenders are fine with single word decoding, but struggle with reading comprehension. The main point is why if we know that reading comprehension will come online later in dyslexic students do we trigger what may be severe test anxiety and inappropriate grade retention by testing students in the 3rd grade with advanced reading passages? The question is not trivial. Children with LDs like dyslexia are at higher risk of depression and anxiety in schools, and test anxiety has direct relationships with higher levels of school stress, emotionality, and school avoidance, and lower self-esteem and self-efficacy. Higher levels of anxiety lead to lower working memory and academic performance, so a vicious cycle can take place. The issue is especially important in the setting of certain states assessments in the early grades because of the substantial evidence that grade retention has a negative effect on students with dyslexia and other LDs. For Premium Subscribers we’ll discuss strategies for reducing anxiety for students with LD in classrooms.